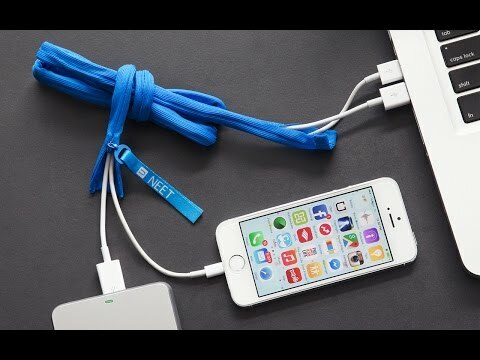 Great for eliminating the usual tangle of cords. I bought two, and can immediately tell by the color whether it's for my iPhone or my iPad. Keeping wires organized is always a problem, I’ve tried many products that ultimately do not help. Two weeks now and one does keep multiple wires tidy! Use them and they work! 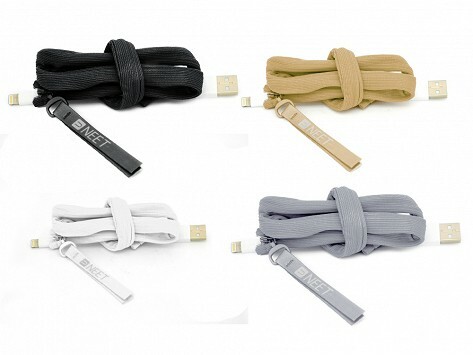 This little cable keeper really conceals the cords and you can shorten or lengthen as needed. I use my when I get ready for bed so I keep it closer to my iPhone and am not getting all tangled up anymore! This product is very helpful. It would be nice to have different lengths and widths to make it even more useful. asking where did you find this ? I told them " The Grommet "
They began reading how the cable keeper could be used. Have only one cord in it but it is nice to set it and forget it. Does not move. Holds three cables and holds the position. I like these a lot. Well made. I just wish there were longer sizes available. More proof that inspiration can come from anywhere: this line was inspired by a trip to the jewelers. Peter Chin, a manufacturing pro, was buying a necklace for his wife. He noticed how the clerk wrapped it to make sure the chain stayed tangle free. Realizing all the other things he could untangle, Pete went to work and, less than week later, NEET was born.